This loaf is great for those busy mornings or as a mid afternoon snack. 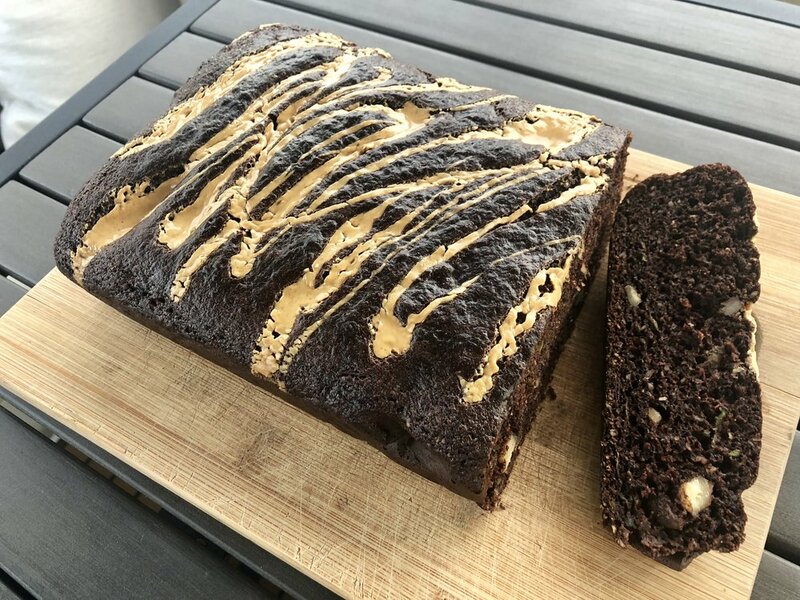 Enjoy this brownie like loaf without compromising your health. Free of refined sugar and wheat. Tastes the best toasted with butter, duh! Whisk together wet ingredients in large bowl. Grate 1 medium sized zucchini into separate bowl, then gently squeeze with paper towels to remove moisture. Pack together to measure ½ cup and add to large mixing bowl. Whisk together, then fold in remaining ingredients. Place parchment paper over loaf tin and pour batter over the top. Drizzle peanut butter on the surface and using a wooden skewer or knife, swirl almond butter to create marble-looking texture. Preheat oven to 400F. Lightly grease 2 baking pans and set aside. Make a well in the middle and add 1 cup buttermilk. Mix until just combined. Don't over mix. Now is the time to add lemon zest. 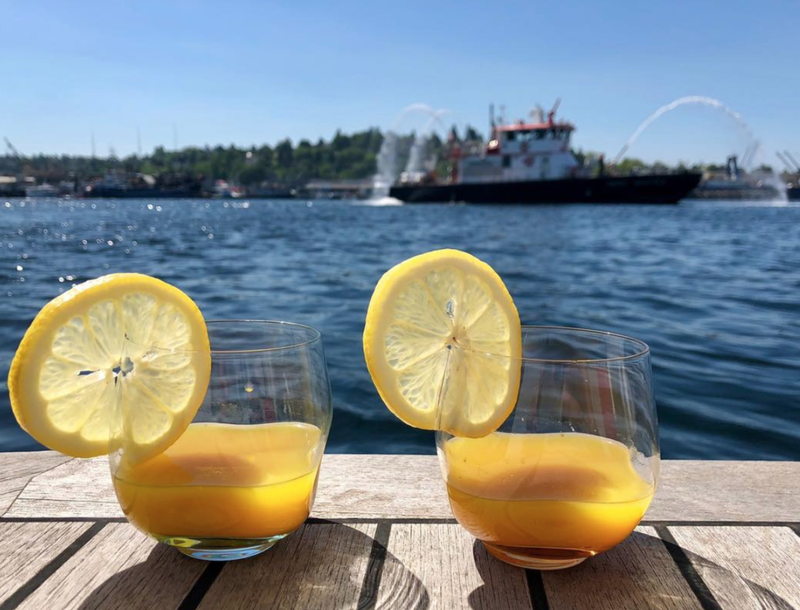 Prepare frosting by mixing powdered sugar, vanilla extract and lemon juice together. Set aside. 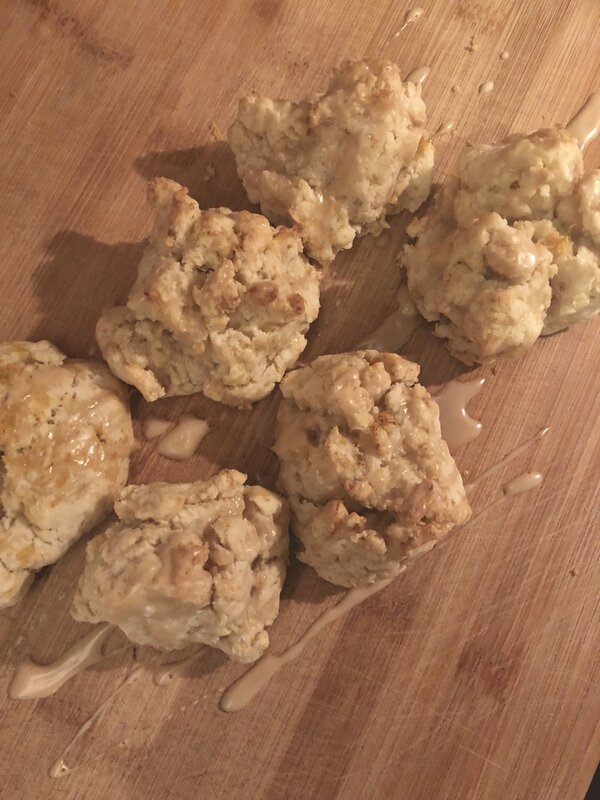 Take scones out of the oven, drizzle with frosting mixture and serve warm with butter. I’ve been on a chia seed kick lately! Chia seeds are high in fiber, omega 3’s, protein and antioxidants so it’s hard not to love this nutritious little seed. The combination of sweet and creamy pudding mixed with the tart mango smoothie is quite an enjoyable food experience! Highly recommend giving this a try! Combine all chia seed pudding ingredients in glass container and allow to chill 2hrs-overnight. Place all smoothie ingredients in blender and blend. Add smoothie to the top of refrigerated pudding and enjoy as a healthy breakfast, dessert or snack! Mix almond milk, chia seeds and maple syrup together and set aside for 2 hr - overnight. Layer plain yogurt, berries, granola (if preferred), and drizzle honey over the top. Great as a breakfast, snack, dessert! Who doesn't love a healthy spin on a classic favorite! Enjoy this creamy mint chip shake as a healthy breakfast, mid day snack or dessert! 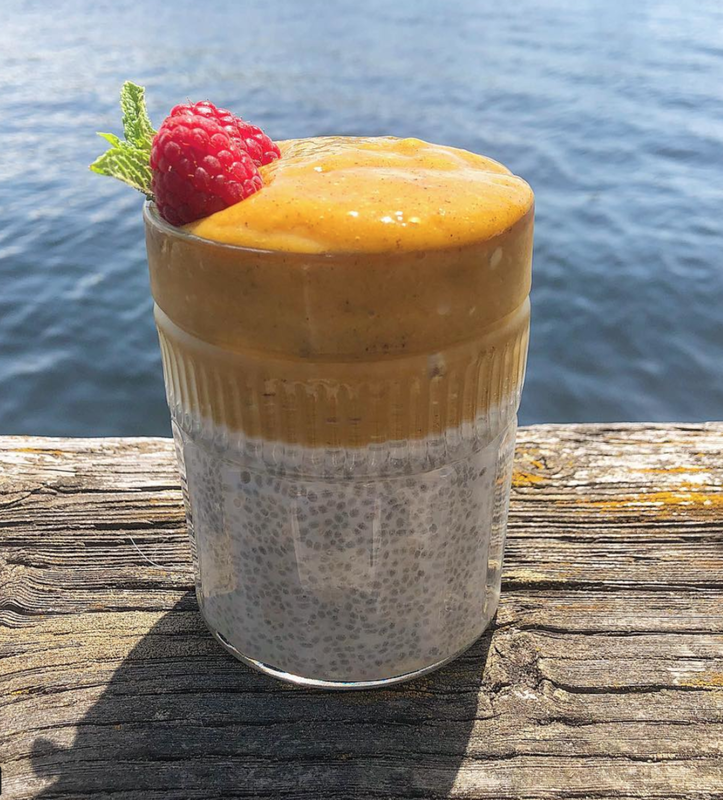 The texture of this chia seed pudding is perfectly thick and creamy and is a great option not only for breakfast but as a snack or dessert too! Chia seeds are packed with antioxidants, omega 3's and fiber plus it gives you that full feeling for hours after eating! Combine almond milk, chia seeds, cocoa powder, maple syrup and stir until cocoa powder is fully mixed. Place mixture in 4 separate containers and let chill for at least an hour but can be overnight. Add coconut shreds, chocolate chips, almond flakes, and raspberries as a garnish and violà! 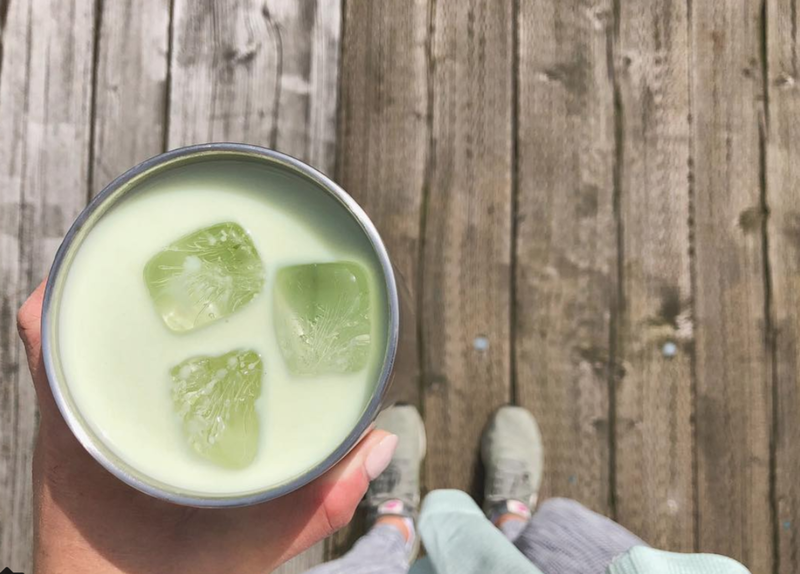 Matcha tea is an amazing substitute to coffee, rich in antioxidants and perfect this time a year! You can find matcha powder at most grocery stores or of course on amazon. I like the Navitas Organics brand! 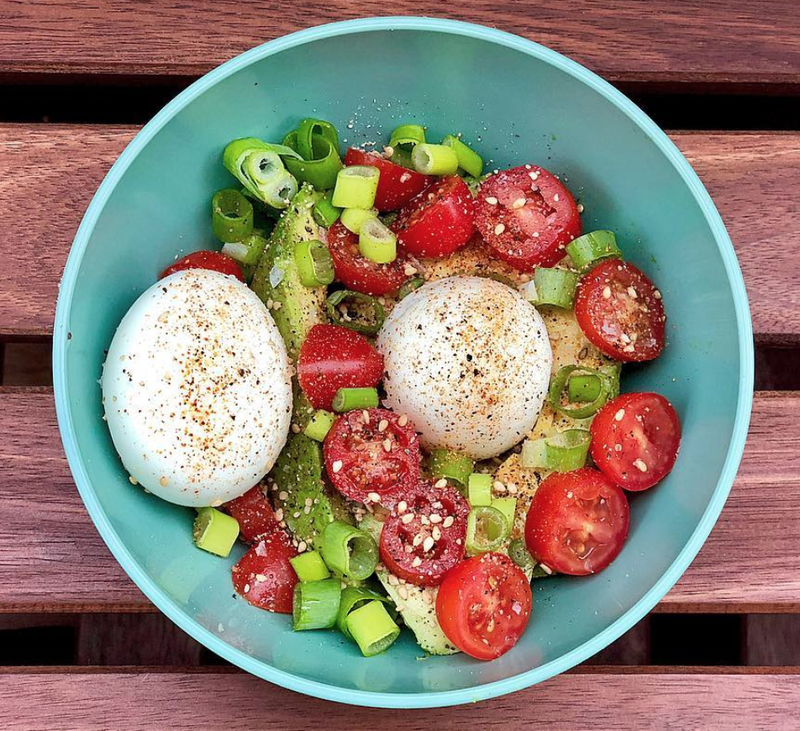 Whipped up a quick lunch bowl using avocado, @vitalfarms hard boiled eggs, tomatoes and green onion with @maldonsalt1882 flaky sea salt, pepper, sesame seeds and a dash of creole seasoning. This healthy lunch took 3 minutes to make and costs under $4 although I’ll be honest, I could definitely eat another whole bowl. Mmmm love quick grab n go snacks in the morning... or really all the time lets be honest. These are so perfect with a cup of coffee. Pro tip: heat muffins for 15 seconds in the microwave with a little butter. You won't regret it! In a medium bowl combine flours, baking powder and sugar. Stir in dates, carrots, applesauce, eggs, canola oil and vanilla extract. Bake for 20-25 minutes or until tops are golden brown. 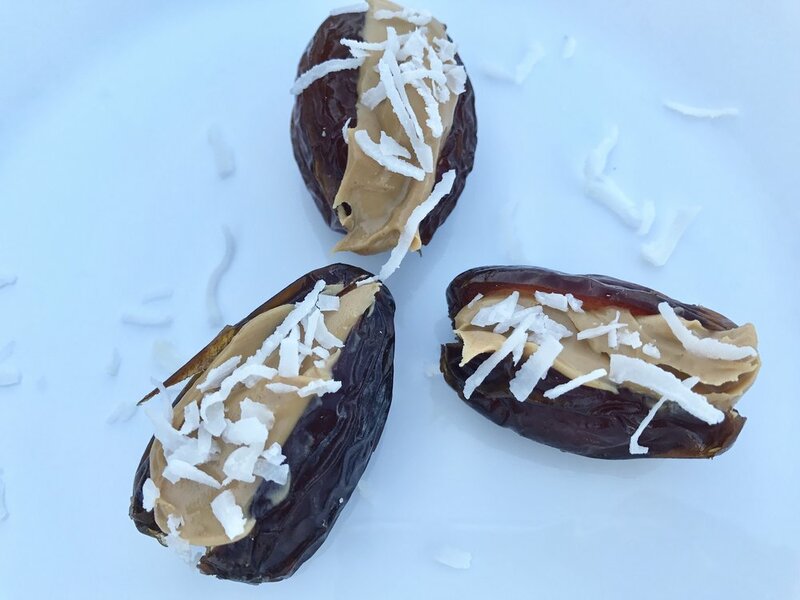 Dates, Peanut Butter, Coconut Oh My! No time to make a substantial breakfast in the morning? This has been a go to for me lately! Dates are easily digested allowing your body to make full use of their goodness and the dietary fiber in dates helps to remove waste in the colon. They also contain Vitamins K & A which help maintain healthy skin and nails and protect the eyes. Aaaand then there's the peanut butter. Peanut butter is the perfect compliment to a date in my opinion. Some salt to balance out the sweetness in the date and the crunch from the coconut flakes. Yea, all the yum. Enjoy! Blend all ingredients except coconut flakes. Once smooth, add coconut and blend for 2-3 seconds just enough to mix in coconut! These are blissful little bites for many reasons. Easy to grab and go, incredibly flavorful, filling and healthy! Muffins for breakfast have been slowly sneaking into my life more and more. Early mornings are hard especially with back to back appointments. This is such a simple answer for breakfast and sure beats skipping or waiting until I'm a code red hangry at 10am. I hope you enjoy them! My girl Lindsay over at toastedpinenut.com was the inspiration for these muffins with a few modifications. She makes yummy dishes and I'd recommended following her for other delicious recipes. Chop the broccoli and kale. It's best if the broccoli is chopped smaller so you get some with each bite. Same with the kale. Put the cooking oil, broccoli and kale in a pan over medium-high heat. Sauté the broccoli and kale for about 5 - 7 minutes. Add in the cheese, broccoli and kale. Sprinkle top with additional cheese (optional but actually just do it). Cool on a rack and store in an airtight container in the fridge until you're ready for pack 'em and eat 'em. I'm often rushing out the door for early morning appointments and a muffin along with a cup of coffee make my mornings a lot better. These muffins are pretty hearty because of the flax meal which I love. I ran around the grocery store twice before asking the clerk where they keep flax meal and he kindly pointed me to the refrigerator section. Pro tip: I would store leftover flax meal in the fridge as it goes bad quickly. Lindsay over at Toasted Pine Nut introduced me to this recipe but I've played with it a little by adding more flax meal. I enjoy toasting my muffin and adding a little butter and then peanut butter. It's the bomb. Whisk together the eggs, agave nectar, water, and melted coconut oil. You want to melt the coconut oil and let it cool a bit before combining it with the eggs. Add the almond flour, flax seed meal, cinnamon, baking powder, and sea salt. Grease your muffin tins or use muffin papers (I recommend using papers). Fill the cups until they're almost full. The muffins rise, but not a ton, so you can fill it almost all the way. Add additional raspberries to the top of each muffin. Bake for 25 minutes, checking after 20 minutes (just being cautious because every oven's different). Allow the muffins to cool on a cooling rack and drizzle with peanut butter! You can't go wrong with this breakfast item. With endless add ons and substitutions it works for just about everyone! Fuel the brain and body for a productive, energy-filled day and honestly feel 100% satisfied afterwards. Healthy can and does taste good! - Remove toasted bread from oven and add all ingredients on top. These are perfect for those mornings with no time to make breakfast. Packed with protein and naturally sweetened it's hard not to love this grab-n-go snack. Blend all ingredients in a food processor except chocolate chips. Add a splash of water if needed. Roll balls in mini chocolate chips and chill for 15 minutes prior to enjoying!